This entry was posted on April 2, 2013 by Tintean Editorial Team/fdg, in Book review, History. Bookmark the permalink. Mary Elizabeth Calwell: I am bound to be true – the life and legacy of Arthur A. Calwell. Mosaic Press, Preston, Victoria, 2012. Looking ahead, Mary Elizabeth Calwell’s memoir of her distinguished father Arthur Augustus Calwell (1896-1973) will be a useful guide to what might be called a family view of the many controversies of his political and public life. It cannot be called a biography. It is a history with love. One searches fruitlessly for any assertive examination of her subject’s human flaws. The book is however a welcome guide to his achievements. For this reader there was no new information nor any insight other than what might be expected from a literate and loving daughter. Calwell’s life was rich with acts of generosity many of which are meticulously presented in this book, revealing an instinctive humanity and goodwill. However, as a researcher, Mary Elizabeth Calwell had only a clear eye for the gold, of which there was much. She has left the dross to others to uncover. Curiously, given this bias, what was widely regarded as Calwell’s greatest parliamentary speech in responding to the Coalition government’s decision to send Australian troops to the Vietnam war in 1965 is not mentioned. It was a prophetic speech dramatically pointing out the futility of the war and its long-term likely outcome – defeat for the allied cause. 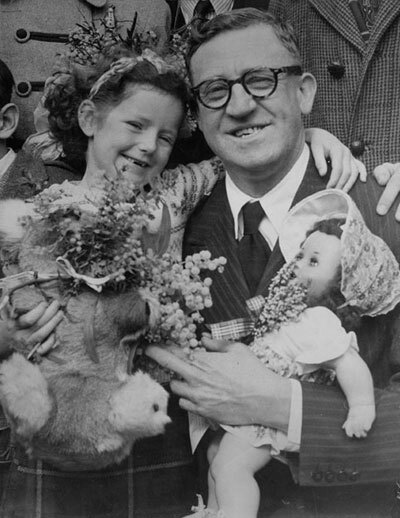 More than half a century after the passing of Arthur Calwell, it is well to be reminded of his greatest achievement: as Minister for Immigration in the Chifley government from 1945-47, he inaugurated and implemented Australia’s greatest migration program ever, which brought a million people from war-ravaged Great Britain and Europe came to Australia in the decade following World War 2. He volunteered for military service in the Great War but was rejected because of his flawed eyesight. He was president of the North Melbourne Football Club and a trustee of the MCG in which role he initiated the building of the old Southern Stand (long since replaced). He was passionate about his Irish heritage. His maternal grandfather, Michael McLoughlin from County Laois, deserted ship in Melbourne in 1817 at the age of 17. Mary’s Elizabeth Calwell’s book reminds us of her father’s blend of a passionate sense of social justice with his understanding of his Catholicism in a pluralist democracy. Today, Calwell seems an outdated figure, with his rigid moral code (he saw homosexual law reform as an abomination) and his unbending commitment to the White Australia Policy. These were both normal attitudes for his times. Beyond all that, Mary Elizabeth Calwell reminds us that her father was an outstanding politician and an outstanding human being. And why not? Paul Ormonde is a Melbourne journalist who has specialised in the history of the relationship between the Labor Party and the Catholic Church. He is the author of The Movement (1972) a critical analysis of the organisation founded by BA Santamaria.